Last year I launched a mini-campaign to pilot a set of Chromebooks at my school. 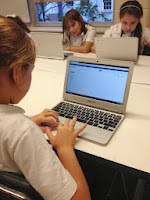 I was fresh off the Google Teacher Academy and eager to replace our current netbooks with a machine that was stronger, faster, easier and cheaper. I was very fortunate to have a school administration that supported me wholeheartedly - offering me a Chromebook to fool around with at home and in the classroom as I researched 1 to 1 programs launched by colleagues in the Twittersphere. I blogged quite a bit about how much I liked the Chromebook, and after considering the pros and cons with my admin and Tech Department, we decided to forge ahead with a set of 20 Chromebooks for the 2013-2014 school year. After much hard work by the wonderful Technologists at my school, the Chromebooks arrived in my 5th Grade English classroom this afternoon. As soon as I knew we would launch the pilot, I contacted +Jason Markey and +Kern Kelley, two Google Teacher Academy colleagues who have worked not only with Chromebooks but with successful student-led tech initiatives. 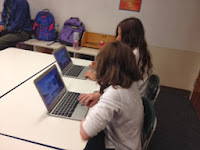 +Erik Nauman and I read over blogs written by Kern, Jason and their students and were eager to provide our own students with leadership roles as 'Chromebook Ambassadors' in our pilot. Today after school, Erik and I met with a small group of 5th Graders in order to preview the Chromebooks and walk through the steps of logging in, creating folders and sub-folders, and sharing documents. Our ambassadors were eager for the opportunity and learned quickly! Indeed, the Chromebooks are so intuitive that the biggest challenge we faced as we introduced students to the devices was convincing them not to rush ahead of our directions. It was delightful to see them so excited to learn about the new technology, exclaiming to one another how "speedy" and "cool" the laptops were. I suspect that during tomorrow's English classes I could leave the entire task of introducing Chromebooks to our student leaders and they would run the show spectacularly.